What’s your take on Valentine’s Day? When I was a kid, it was second only to Christmas in my book. 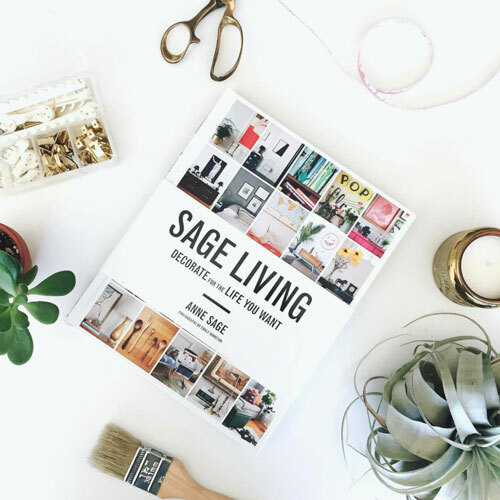 I adored everything about it, from the pink-and-red color scheme to the crafts with heart stickers and lace doilies, and from the chalky candy hearts to the classroom parties with cupcakes and homemade mailboxes. These days, though I don’t mark February 14th with the same degree of fanfare that I did in when I was in elementary school, I do still fete the day by honoring one of its most central tenets: the shameless indulgence in chocolate! That’s exactly why I’ve been saving this chocolate avocado mousse recipe in my back pocket, keeping it at the ready for a midwinter cocoa fix that will have you making love to your spoon. If you’re skeptical about avocado in a chocolate dessert, then just trust me when I say that you’re in for a real treat! 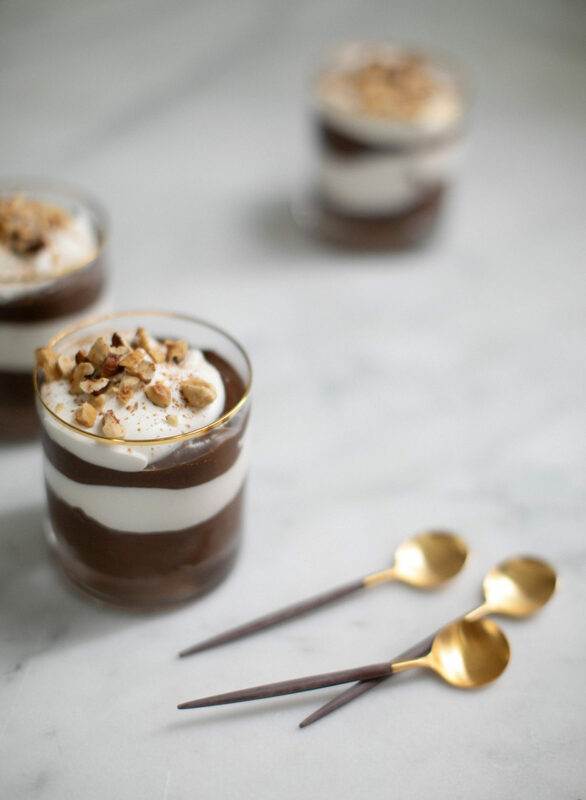 The avocado flavor is totally hidden by the rich chocolate and sweet maple syrup, and the resulting mousse is just rich enough to satisfy cravings but not so over-the-top that you’ll feel weighed down after the last bite. Plus, it’s also nice to enjoy a dessert that loves your body back. The healthy fats and antioxidants in this recipe can easily be passed off as necessary self care! 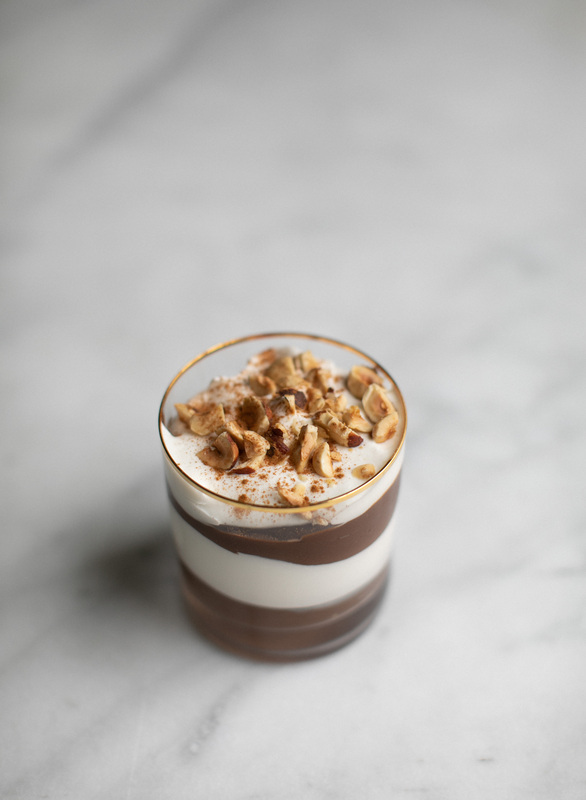 For the photos here, I layered the mousse in clear glasses with whipped coconut cream—a great option if dairy is off the menu. 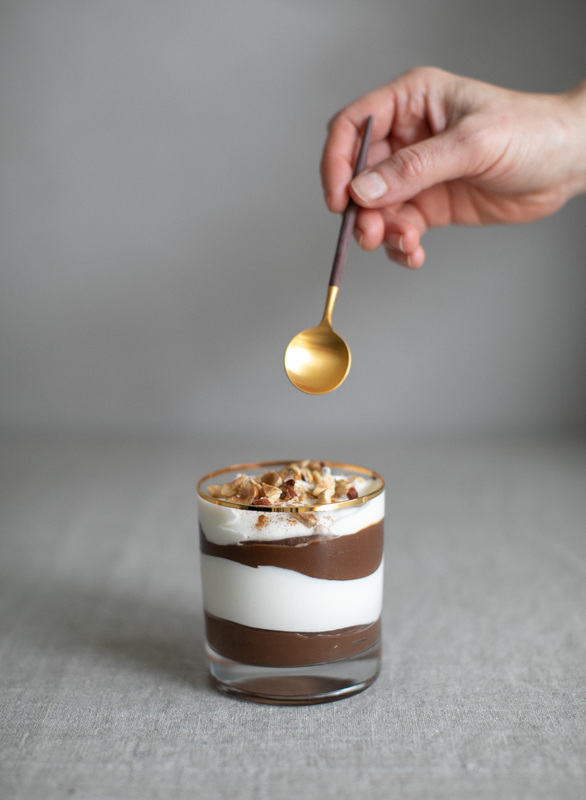 If you’re not into that level of effort, you can of course portion just the mousse in any small container and then dollop with the whipped topping of your choice! 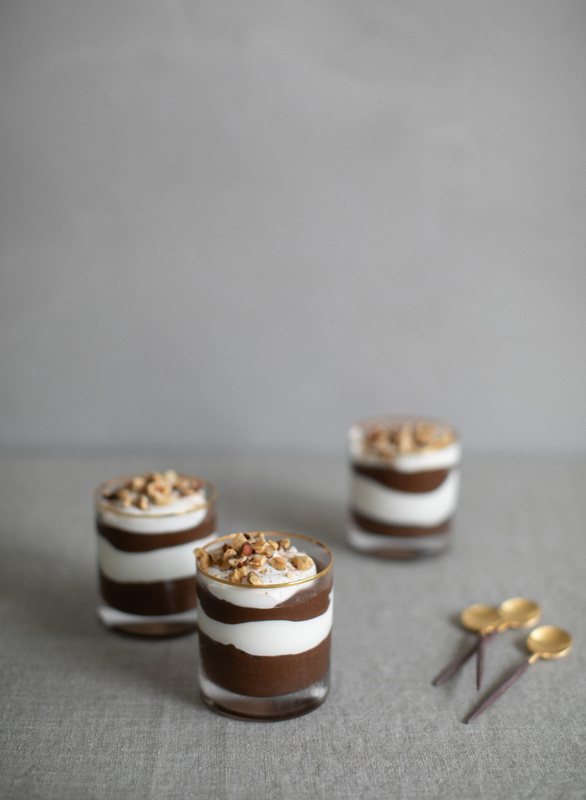 I’ve never tried it, but I suspect you could pop these in the freezer overnight and have a chilly, delicious frozen mousse situation on your hands when you’re ready to serve. That’s assuming, of course, that you can resist temptation for long enough to let it set! Scoop avocado from its skin and add to blender with vanilla, cocoa or cacao powder, maple syrup, agave nectar, almond milk, and salt. Blend to a coarse purée. With motor running, gradually stream in hot (but not boiling) water. Blend, adding more almond milk as needed, until smooth and creamy. If you have a small-to-medium sized blender, make this in two batches to avoid overflowing. Divide mousse among twelve 6 oz. ramekins or small bowls. You can either layer the mousse with your whipped topping of choice now, and chill (covered) for at least two hours. Or, simply divide mousse into small bowls and chill, then just before serving, garnish with dollop of whipped topping. Sprinkle with cinnamon, top with hazelnuts and/or cacao nibs. Enjoy!